When it comes to blogging tips it cannot be given any better than Darren Rowse and as I follow his blog and have gone through his book about secrets of blogging I would like to compose some blogging tips. These tips are mainly from the knowledge I got by following problogger blog and his book. Don’t Schedule yourself to write your posts but let the posts force you. Stay focused with small and short paragraphs and don’t be scared of your own views on anything no matter how odd it looks to you. Write unique, interesting and engaging content you love to write about using your own perspective with honesty and passion. Try blogging consistently and regularly about relevant and up to date subjects in your industry. Interact with not only your readers but also readers of other blogs and specially your competitors. Write it informally with lots of fun elements. Make it look like you are answering an email from a friend. Write whats in your mind and have good grammar. If you do not have control over grammar use Microsoft Word to make it better to an extent to start with and try learning your grammar as you move along. Proofread many times your articles for misspellings. Give credit where due and always linkback to your sources. Good blogging is nothing without community & respect. Respect your readers and don’t ignore them. If they have some suggestion to offer, listen to it and work on it but if you cannot work on it atleast listen to it and tell them why you cannot work on it now but would consider it later. After the title next best thing is the opening lines. They are what compel your reader to either read on or move along. I prefer to use the opening lines for meta description. Don’t blog what you think people want to hear. Blog what you truly believe in. Be passionate, and stay true to yourself. Be helpful, informative to your reader, even if that means blogging less! Learn to how to give first to your reader. Make your blog worth reading. After your last preview ask yourself why would anybody read this article. And add an image that adds the feel of your article. Be passionate and serious about blogging. If you aren’t 100% passionate about your topic, change now. Brand yourself and make your authority felt in your blog. Don’t be ‘Yet Another Blogger’ there are a millions, try to be unique. Don’t sell out or try flipping game because you may decrease your own value. Readers want to know you, not just what you know. About, Picture, contact info … i.e. Be available. Think about blogging when you are not actually blogging. i.e. When you are in coffee shops or at other places. Note down the thought before it evaporates. I have more drafts in the blog then the number of posts at times. Don’t Be stataholic or adsense Freak. If your blog is new don’t login to your Adsense account daily to verify how much you made today. Keep writing good and unique content and do not quit. If it does not get good readership it would get eventually. Buy your own domain. Hosting does not cost much these days. Check out Best Shared Cheap Hosting. Be concise when it comes to writing. Increasing the Length of your article will not make it any better. If you overcome some problem its a good article content for your site. Don’t try to please everyone with your content but try to be honest. Do not spend most of the time writing but try giving more time to promoting your blog as well. Be it online or offline promotion. Mastering your Title of the post is an art. You should select your title in a manner that it entices user as well as contains the search terms. If you are trying to review any new product, try to post early and at times be the first one to review it. You would have upper hand when people start searching about it in Google. Remember Quality would always supersede quantity. Write posts you yourself would want to read, or else don’t write. Leave relevant & interesting comments on other blogs. Write for people and not for search engines and search engines would follow you. Don’t forget your keywords when you are in the middle of your post. Organize your content, categories and tags which is easy to navigate. Follow your competitor and see what questions are their readers asking in comments and try answering them in your blogpost. Use the best tools in the business like WordPress over Blogspot, Aweber over Feedburner and GetResponse. Don’t only concentrate on Social Media and Search Engine Marketing but you should also focus equally on Email Marketing from Day 1. Last but not the list try to follow these tips l0l 🙂 and if you have more tips leave them in comment and I would try to add them to the list. Nice tips, will surely follow them. Agree with you that Branding and showing authority is mandatory. Also addressing competitor blog reader’s query in our blog post is a great idea. Nice tips, can u provide some advanced methods for modifying a blog, say a wordpress blog ? I am new to this wordpress thing. Don’t know much about plugins and all.. Want to add a rss feed icon on my blog but unable to do so.. can you help me out ? Almost all the parts you defined well and I will work as well, thanks for being a blogger like this and helping to the beginners like me. Thanks and yes I know and this blog is not about my money making from it because I make them from other site but this blog is my personal blog about how I made my sites what they are today. This is quite a comprehensive list Sabbir. Thanks for sharing. You must love what you do. Blogging is never a money-making gig. If it is, you better like green paper, because you'll only receive that along with a ton of headaches. Keep the content fresh, but daily writing is not necessary. This is writing for the search engines, which is a no-no. Write for people, not things. Leo Babauta at Zen Habits posts every few days and doesn't have a problem drawing in a fantastic readership. He also does no SEO. But the man is passionate in what he writes about. If you feel the need to do anything, stop. Do things from a place of want, not need. Thanks and yes I know and this blog is not about my money making because I make them from other site but this blog is my personal blog about how I made my sites what they are today. 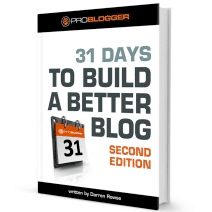 I'm currently digging thru Darren's ebook 31 Days to Build a Better Blog. It is great I must say. This book seems to be a great one too. Thanks for the heads up! Didn't know he wrote a paperback! Yes thats also one of the best one and I have that as well and yes Darren has 2 books which is a bit confusing unless you look at the titles very carefully. I will surely remember and use them when I create my blog.